For the island group in Canada, see Duke of York Archipelago. In the 1870s and 1880s German commercial firms began to site trading stations in New Guinea. Agents of J. C. Godeffroy & Sohn reached the Bismarck Archipelago from the Caroline Islands in 1872 and had established a trading post on the Islands from 1876. The wreck of HMAS AE1, lost in 1914 possibly due to a diving accident, was located near these islands in December 2017 after 13 search missions. The submarine was found at a depth of 300 metres (980 ft) and was seen to be well preserved and in one piece. The exact location of the wreck was not announced by the Australian government at the time of discovery, to protect it from "unauthorized salvage attempts". The government's stated position is that the wreck will be treated as a war grave. The Duke of York islands consist of a total of 13 islands and cover 58 square kilometres (22 sq mi) in area. The largest island of the group is Duke of York Island, and other islands include Makada, Kabakon, Kerawara, Ulu, Mioko, and Mualim. The island group lies in a seismic active zone, where two tectonic plates push upon each other. Earthquakes and tsunamis are not uncommon for inhabitants of the islands. The islands are low-lying, and are threatened with inundation due to rising sea levels. 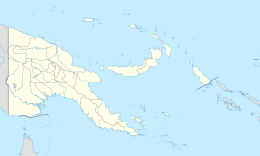 On 28 November 2000 the evacuation and resettlement of one thousand inhabitants to New Britain was announced. ^ Linke, R 2006, The influence of German surveying on the development of New Guinea, Association of Surveyors of PNG. Retrieved 25 January 2014. ^ Zhou, Naaman (21 December 2017). "Australian navy world war one AE1 submarine found 103 years after it vanished". The Guardian. Retrieved 21 December 2017. ^ "'Found': Australian Navy Submarine HMAS AE1 located after 103 years". Navy News. 21 December 2017. Retrieved 21 December 2017. ^ "Evacuation from Rising Seas Planned for Pacific Islanders: 1,000 flee as sea begins to swallow up Pacific islands". The Independent. UK. 29 November 2000. Retrieved 26 March 2007. 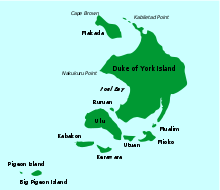 Wikimedia Commons has media related to Duke of York Islands.